The home of Dan Flock and Jenn Maly in Santa Rosa's Burbank Gardens neighborhood is an art deco delight, outfitted with era-specific furniture and fixtures. Maly works in Napa Valley restaurants, and when he's not sitting on Santa Rosa's Cultural Heritage Board, Flock works in IT. "I've chosen to surround myself with things from an era that, at least in people's minds, has a semblance of a simpler time," he says. "I'm barraged by technology all day and by people having issues that they need resolved. For me, coming home to this is very calming." Flock's Spanish-revival house was built in 1937, "the same year the Golden Gate Bridge was built," he says. When Flock bought it in 1994, the lights had all been replaced with cheap contemporary fixtures. With an eye out for era-appropriate lighting, he came across a heavy solid bronze chandelier at an antique store near Roseland. 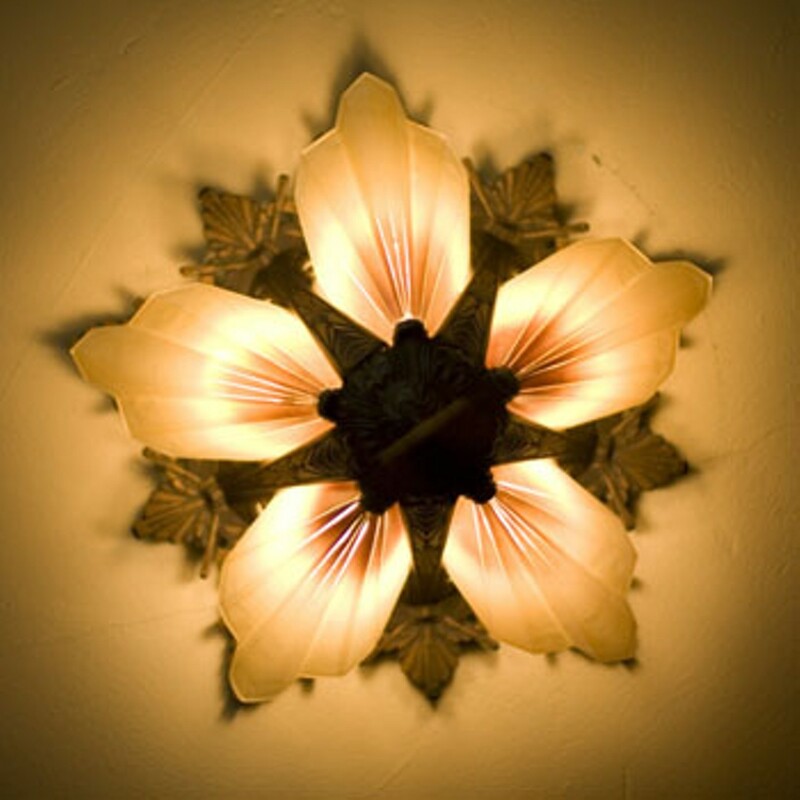 Over the years, he searched for matching fixtures ("It took a long time," he attests), and now nearly all the rooms in his house have the same design. 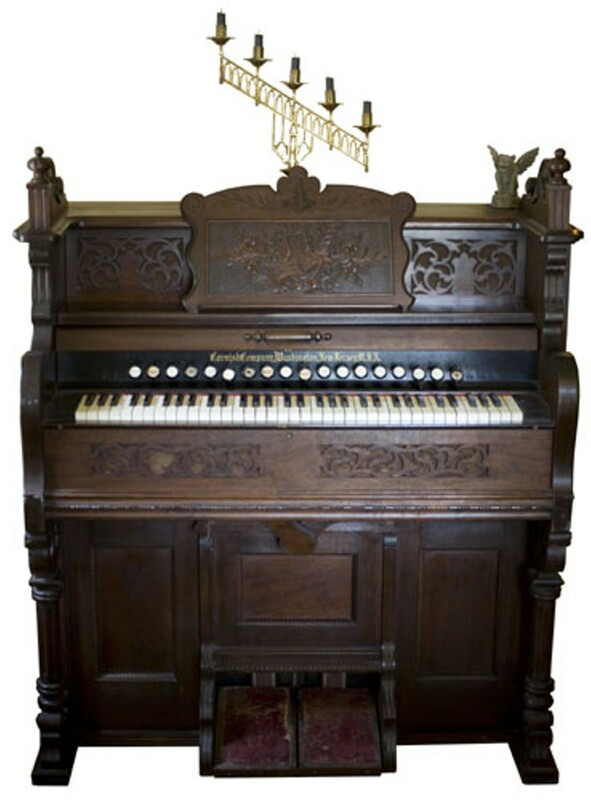 "There was a note that said it was the original pump organ from the Masonic Lodge," says Flock of this ornate, wood-carved pump organ made by the Cornish Company of New Jersey in 1876. Discovered at downtown Santa Rosa's late Helping Hearts thrift store, which was known for pricing items cheaply to clear space from their too-small store, the 134-year-old pump organ set Flock back just $400. Its pull knobs are hand-lettered in gothic font, and, yes, it still plays. A walnut phone booth with a retracting door and green stamped-tin interior sits in the corner of the dining room, acquired from a garage sale just one block from Flock's house. "I think it was $200. It's probably out of an old hotel or something," he says. It was a beast to load into the house, but the heavy black rotary phone inside still works. This old Zenith radio has been plugged in just once, and it got hot, smelled weird and didn't make a sound. Still, its beautiful maple casing and aviation-like controls fit right in with Flock's other furniture from the late '20s to early '40s. When he and Maly went on their first date, they wound up back at Flock's house, looking through art deco books. "I love old furniture and style," says Maly, "so I thought the house was pretty great. And I guess I might have thought he was a little cute, too." They've been together ever since. The radio was given to Flock by a neighbor across the street. 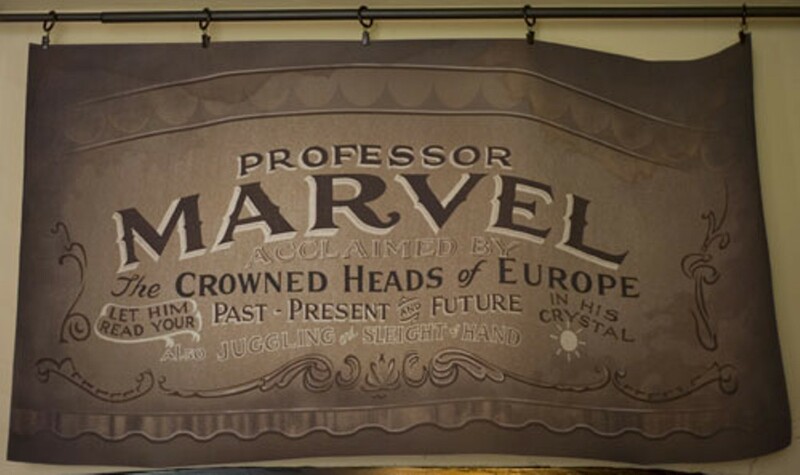 Late last year, graphic designer Jon Heilman created replicas on canvas of Professor Marvel's traveling sideshow wagon, which astute film lovers will recognize from a brief, early scene in The Wizard of Oz T. "I kept looking at it, and thinking, 'Where could I put it?'" Flock says, "and then I realized I have this giant crack in the plaster wall here that never goes away. 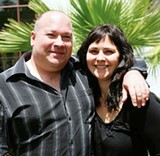 There's no patching that crack, it's just going to come back, so I was doing myself a favor by buying it." 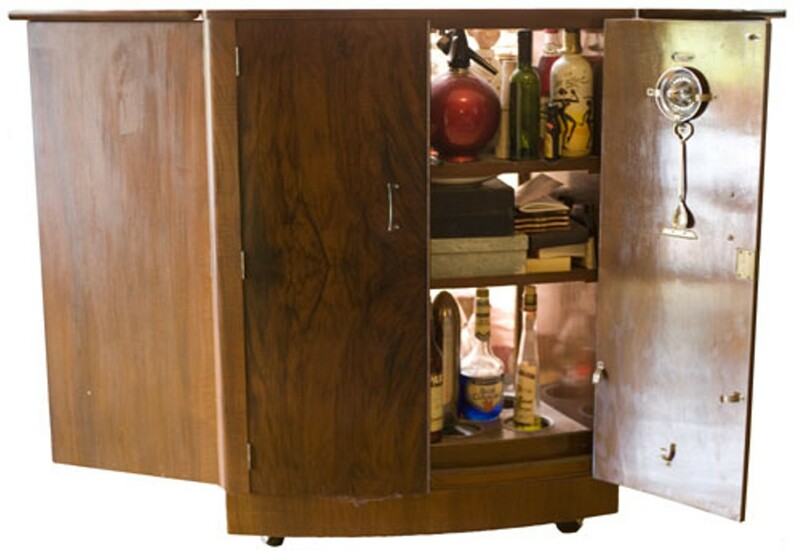 Bought at an antique store in the late '80s with money from a tax return, this fold-out cocktail bar was Flock's first art deco acquisition. It was great for the small apartment he lived in at the time, and it still comes in handy entertaining guests today. Though it's seen plenty of parties over the years, the walnut casing and bird's-eye maple have never been blemished. 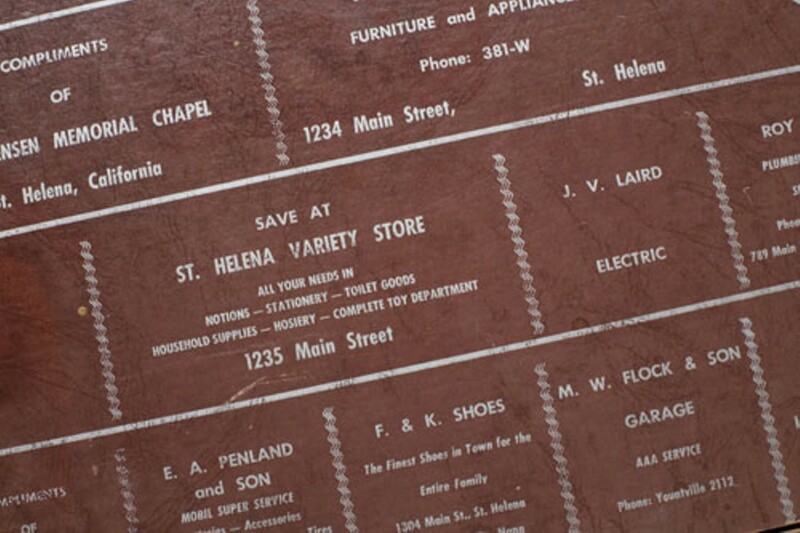 On Flock's living room wall hangs an old card table, which advertises numerous and mostly now-defunct businesses from the upper Napa Valley like Keller's Meats and Donaldson's Hardware. What makes it special is the inclusion of his great-grandfather's service station, M.W. Flock & Sons, in Yountville. On an adjoining wall hangs a picture of his grandfather, manning the pumps, although there was said to be a roadside attraction atmosphere around the place. "He had a monkey, I heard, and a real live dancing bear named Coco to bring people in," Flock says. "Our eccentricity goes way back in this family."